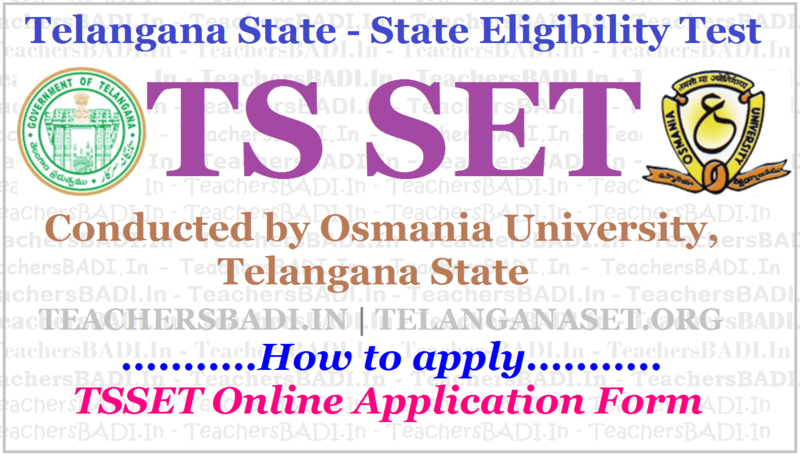 How to apply for TS SET 2019, How to fill the TSSET Online application form, Instructions for TSSET Candidates. TSSET Registration Fee, Mode of payment for TelanganaSet. Telangana State - State Eligibility Test (TS-SET-2019) for the year 2019 will be conducted by Osmania University, Hyderabad in accordance with G.O. Ms. No. 16 Dt. 09-06-2016 for recruitment and promotions of Lecturers/Assistant Professors in Degree Colleges/Universities as per the University Grants Commission Regulations. Eligible Candidates who wish to apply for TS SET 2019 may submit their applications through online mode. The registration fee of Rs.1200/- (for General Category), Rs. 1000/- (for BC Category) and Rs. 700/- (for SC/ST/PWD Category) towards application registration and processing is to be paid through payment gateway (Credit card/Debit card/Net banking). The detailed information is available on the website www.telanganaset.org. MODE OF PAYMENT: TS-SET- 2019 Applications should be submitted through online mode only. The Registration fee for online submission and late fee, if applicable must be paid through payment gateway (Credit card/Debit card/ Net Banking).After getting Unique Registration Number(URN), candidate is requested to login after 24 hours for payment and other details. Further, to obtain confirmation page the candidate is required to login after 24 to 48 hours for application details and printout. Osmania University has invited applications for TS-SET 2019. Candidates can check the online application form at the official website at telanganaset.org. Telangana State Eligibility Test (TSET) is conducted by Osmania University for recruitment of lecturers and assistant professors in universities in Telengana. The last date to apply is April 26. The exam will be held in computer based test (CBT) mode on July 5 and 6, 2019. Candidates are advised to apply online only. b. The application form must be completed as per the notification. c. Incomplete application forms will be rejected. d. Only blue ball point pen should be used to mark the answers in the OMR sheet. e. Before applying on-line candidates are advised to go through the detailed notification available at SET website. f. Candidates must read the eligibility criteria carefully and must satisfy themselves regarding their eligibility for the test before filling the on-line application. g. Candidates seeking admission to the test must apply on-line through a link “ONLINE REGISTRATION” available on the SET website. i. SET agency may change the examination center or date of examination without assigning any reason. j. No TA/DA will be paid to the candidates appearing in the SET. k. Canvassing before or after the examination in any form will disqualify the candidate. l. The decision of the TS-SETshall be final in all matters. m. All legal disputes pertaining to TS-SETshall fall only within the jurisdiction ofHyderabad. n. The use of calculators or log- tables are not permitted. Cellular phones, pagers and electronic devices etc. are not allowed in the examination hall. o. It is compulsory for the candidate to appear in all three papers. The candidate who does not appear in paper I and II will not be permitted to appear in paper-III. p. The candidates will not be allowed to write any question from the test booklet on the hall ticket or in any other paper. Candidates should submit the applications through online mode only. Steps for submission of Online application form. a. Before applying online, candidates are advised to go through detailed notification available on website www.telanganaset.org. ii) scanned the signature of the candidate in JPEG (.jpeg) format of less than 20 kb. If candidate belongs to BC/SC/ST category must attach scanned copy of Community Certificate issued by MRO.Candidates belonging to PWD category must attach a certificate issued by competent authority. d. In order to avoid last minute rush, the candidates are advised to apply early enough.SET office will not be responsible for network problems or any other problem of this nature in submission of Online Application during last days. 1) Examination Hall Ticket will be provided online to all candidates from .... 2019 onwards. Candidates have to click the link “Download Examination Hall Ticket”. Provide Unique Registration Number (URN) and print the Examination Hall Ticket. 2) Candidates have to download and get a printout of the Examination Hall Ticket. It will not be sent to the candidates by post. 3) Candidate must carry the Examination Hall Ticket and also one additional photo identity such as Aadhar Card, Driving License, Voter ID, College/University Identity Card, PAN Card, etc, to the examination center on the day of the examination. 4) If your Examination Hall Ticket does not display the image of your photograph, you have to paste the photo at the appropriate place and get it attested from a competent authority. 5) The candidate is not allowed in to the examination hall without the Examination Hall Ticket. 6) Please confirm that your Name, Subject, Centre, etc, shown in the Examination Hall Ticket are correct. If there is any error in the Examination Hall Ticket please contact SET office immediately and submit a written application. Otherwise SET Office will not be responsible for making necessary corrections and will not be responsible for providing benefits or for loss arising out of these to the candidates.